Scenes from Moscow’s kangaroo court. MOSCOW—Mikhail Khodorkovsky, once Russia’s richest man, has been in court for so long that only the hardy, like the wall-eyed man haunting the courthouse in a Che Guevara-style Khodorkovsky t-shirt and the “Free Khodorkovsky” plastic shopping bag, have dared to follow his case. “I’ve spent seven years this way,” says Marina Khodorkovsky, the ex-tycoon’s mother, a bright-eyed former metals engineer. First, there was the year and a half of legal proceedings after her son’s dramatic October 2003 arrest, when special forces stormed his private jet in Siberia. That culminated in a 600-something-page guilty verdict that took the judge fifteen days to read aloud from the bench. Khodorkovsky was then sentenced to a nine year lockup and taken to a Siberian prison, where he was attacked in his sleep for allegedly sexually harassing his cellmate. Then, as talk started to turn to his possible parole and even release in the fall of 2011, the state Prosecutor General slapped Khodorkovsky with charges of stealing 350 million tons of oil and more charges of money laundering and embezzlement, these carrying a sentence of over 20 years. The moon-faced, salt-haired 46-year-old—Russia’s most famous political prisoner—has lived through a tectonic reversal of fortune. Once a reviled robber baron who made billions in the banking and energy sectors during the lawless ’90s and who went to jail for only partly political reasons, Khodorkovsky has become a martyr and a fundamental pillar of the liberal anti-Putin establishment: the very people who once hated him. 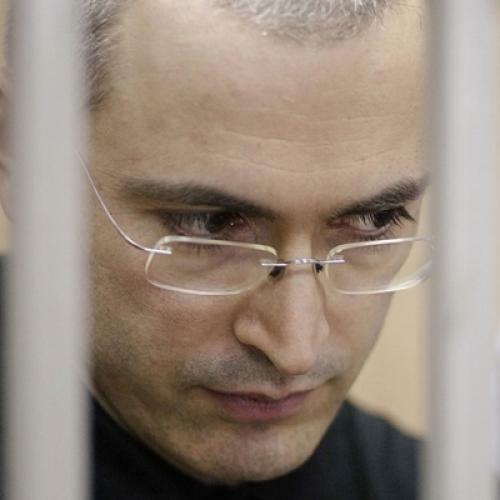 Monday, after prosecutors finished the year-long process of reading their indictment into the record and trotting out ambivalent witnesses, Khodorkovsky was finally allowed to speak in his own defense. The courtroom stirred. It was stuffed beyond capacity, which the Kalashnikov-toting special forces made sure to reduce. People were hanging off of bench corners and sitting in each other’s laps. (A colleague joked that he was “sitting in a fat man.”) It was an older crowd of family and supporters from the Russian opposition. In the best of Russian traditions, some of them brought flowers for the defense team. Outside, the overflow grandmothers kept out of the courtroom soon began to yell at the guards that the simulcast in the simulcast room wasn’t working. A handful of Khodorkovsky lawyers and public relations specialists flitted about the courthouse, which looks like a dilapidated Stalin-era schoolhouse full of peeling ochre linoleum. It was the last day of Passover, and Khodorkovsky, who is Jewish, decided to make the day an instructive—and festive—one. “Oil, your honor, is a liquid,” a calm Khodorkovsky began from his fish tank, a bulletproof glass-and-metal cage he shares with his co-defendant and former business partner, Platon Lebedev, who appeared, as always, in his signature black Adidas tracksuit. Given that premise, Khodorkovsky wondered aloud, how could anyone steal 350 million tons of oil? And that’s when his lawyer, Vadim Klyuvgant, reached under his desk and placed a three-liter bottle of crude on the defense table. With its gold and black layers, it looked like separated balsamic vinaigrette and smelled like a gas station. Khodorkovsky summoned Klyuvgant to the cage, accepted from him a pink piece of paper, and explained that they had just performed an oil trade wherein Khodorkovsky now owned the oil, which remained physically with Klyuvgant. So how could Khodorkovsky steal oil that he did not physically have? The rhetorical exercise was lost on the presiding Judge Danilkin, who declined Khodorkovsky’s motion to perform an experiment to steal massive volumes of liquid. “Get that flammable substance out of here!” he screamed. “You don’t have any gasoline in there, do you? !” The courtroom erupted in laughter. “I don’t see anything funny about this,” Danilkin shouted at them. The oil was removed and, after a brief recess, replaced with water, “which, I hope, will not offend anyone,” Khodorkovsky said. It didn’t, but any sense—if any existed—that this was a court of law and a place of serious business was irreparably broken. For the next five hours, Khodorkovsky coolly, quietly argued his case: how did I steal more oil than my company produced, while simultaneously transporting, delivering, and earning profits on it? And how in the world could I just take 350 million tons of oil and what could I possibly do with them? And where are the documents that prove I had personally done this? To all the nodding gray heads in the courtroom, they seemed to be very reasonable questions. In a steady drone, Khodorkovsky read from a long stack of printed pages. At one point he whipped out slides showing tangles of oil pipelines and oil transport schemes, which consternated the prosecution: were pictures allowed? They were, as was Khodorkovsky’s laser pointer, which ricocheted off the bullet-proof glass. Khodorkovsky, as if lecturing a classroom, didn’t seem to notice. He wove in and out of abstruse technical detail and said he was the only one qualified to give it. “You’re dealing with an expert in this field,” he said, noting that he had been doing this for over 20 years since graduating from a Moscow oil institute “with excellent grades.” He dove into legal jargon and obscure citations, calmly berating the prosecutor Valery Lakhtin whenever he interrupted him. “If he’s going to keep interrupting me, he may as well make an objection,” Khodorkovsky said. And the judge, when he wasn’t laughing or rolling his eyes at the defense team, often helped. Sometimes he told Lakhtin which rule he should cite. And Khodorkovsky has the megaphone to tell the world whatever he wants. Much of his wealth is gone and his family has been notched far below their prior opulence, but he still has a press center, lawyers to spare, and several PR agencies around the world working to make sure reporters keep writing about the story, that Russian and Western newspapers keep publishing his political manifestoes, and that dissidents, pro-democracy advocates, and President Barack Obama keep Khodorkovsky’s plight in mind. Even actor Richard Schiff, who played Toby on “The West Wing,” has taken up the cause, visiting Moscow to spend time with Khodorkovsky’s defense team. And Monday Khodorkovsky showed, once again, that he hasn’t lost his operator’s touch. It’s a talent he’ll need to keep fighting the decidedly vague, odd charges against him—charges no one, including his mother, thinks he has much of a chance of defeating.